During nearly four decades of ministry, Charles Spurgeon built London's Metropolitan Tabernacle into the world's largest independent congregation and established a preaching legacy that may never be surpassed. Being a wonderfully visual expositor, Spurgeon preached a remarkable number of sermons that centered around the miracles of Jesus Christ. Journey then with Charles Spurgeon as he paints the biblical scenery of some of Christ's most stunning miracles. 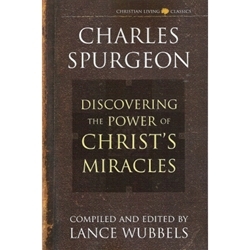 Spurgeon believed that "the object of the miracles is to reveal more fully the power and authority of our Lord's Word and to let us see by signs following that His teaching has an omnipotent force about it." And the splendor of the miracles of Christ is not limited to what they teach us about the power of Christ to rescue us from sin. It is also clear from many of the miracles that the simplest action of life may be sublimely great. There are five books in the Christian Living Classics series. They can also be purchased as a set.